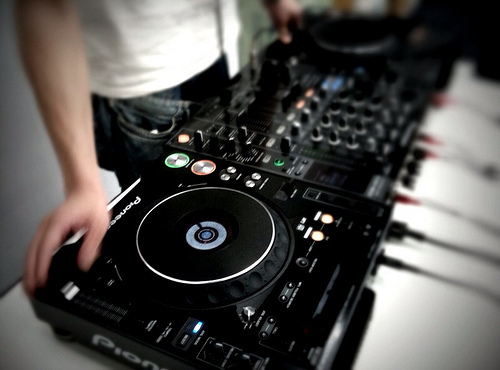 DJ equipment by tatsuhico is licensed under CC BY 2.0. The production process is crucial to learning as students work to understand and make decisions about the product… The three main stages [in the production process] are planning, development, and evaluation.” (Egbert, 2009). Recorder Plus by Turbo Key Studio is a free recording app available on iPad and Android. Recordings can categorized, filed, and shared easily. StudioTrack by Sonoma Wire Works is a multitrack recorder iPad. StudioTrack is a great app for recording multiple parts in an ensemble; it is available for iPad but not Android. Elite Audio Recording Course app by Shane Wellman provides a solid foundation in audio recording with video courses. ProTools is the industry standard audio recording and editing software used by professionals. Pacemaker works with your own song library, or you can use it with Spotify if you have a premium account ($10 a month or $5 for students). The app suggests songs with similar beats-per-minute (beat-matching) and style to create a seamless mix for any event. You can either put it on autopilot or transition between songs on your own. Additional add-ons can be purchased in app for special effects, looping, or EQ. edjing can be downloaded free for iPad or Android. An upgraded version with more features can be purchased for iPad ($8.99). Both versions work similar to other DJ programs. Though edjing won’t work with streaming services such as Spotify, it will work with SoundCloud, allowing users to share their mixes and search for other free music. It also has an automix feature that allows the app to select music by itself with beat matching. A neat feature of edjing is that users get their own webpage to feature their mixes on edjing World. Students can use video editing apps and software to create music videos or compose soundtracks for a movie. Final Cut Pro is the industry standard for video editing in the movie business. Whether a concert, musical, or variety show, live performances provide students with opportunities to combine musical skills with other technology. Egbert, J. (2009). Supporting Learning with Technology: Essentials of Classroom Practice. Upper Saddle River, NJ: Pearson.